Set the example - When in the Fleet, we will have to set the example for our sailors and marines; one such example is our physical fitness. 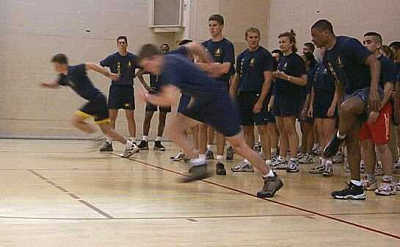 Physicality of the military - While Marines obviously have physically demanding jobs, even relatively "sendentary" jobs in the Navy still require a basic level of physical fitness to deal with the stresses of combat, damage control, and the like. Look good, feel good - Being physically fit benefits one's mental acuity and self-image. Heathly lifestyle - In the long run, being physically fit will let us live longer and better. See the Adobe Acrobat version of "Tips for Success on the PRT." See the cadences page for a way to make running in a group more interesting.